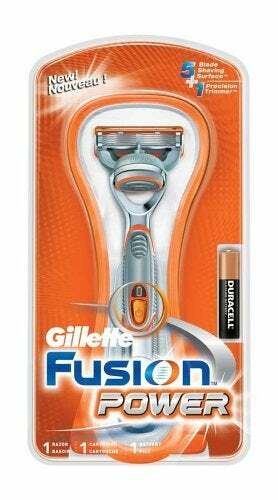 The new Gillette Fusion razor is now available in stores and it seems users are just excited as hell to pay for a product they probably have absolutely no need for. Here's Greg from Texas, a live one, explaining how he went out and bought that baby right when it hit the shelves. I got my Fusion last night (1/26/06) in Houston. I used it and I think it's a winner. The blade cartridge is much larger but the individual blades are about 50% smaller than the Mach3 Turbo. The shave feels much different than the M3T. Maybe it was because it was a new cartridge, but the shave seemed closer with less razor burn. The single blade on the back is a great addition too, but I think it will take some practice to get the perfect sideburns. Wow. Heavy, man. But expect the media blitz to really begin when the Fusion gets airtime during the Super Bowl next weekend. Think half-naked man at sink fondling his close shave with hot woman ogling from behind. The Fusion without power is $9.99 and the Fusion Power will run you $11.99. So get on out there and make Gillette some more cash, will ya?